The breed's coat is short but not smooth (like the coat of a cow), very coarse and thick in order to be perfectly waterproof. It can be black, gray, fawn or red, with brindle variations and a black or gray mask also acceptable. Make no mistake: This is a whole lot of dog, both physically and temperamentally. Theyre smart, trainable, eager to please, versatile, and docile and intensely loyal with their humans, especially children. 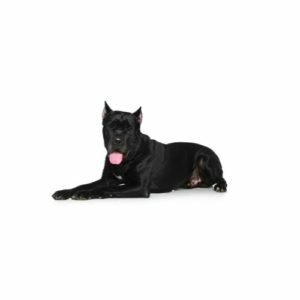 The Cane Corso is a native of Italy, where they played watchdog and hunted wild boar. Prior to 1988, the Cane Corso was known only in southern Italy, and was considered very rare, but has still been featured in many paintings throughout Italys history.